Back again to continue where the 31st episode left off. 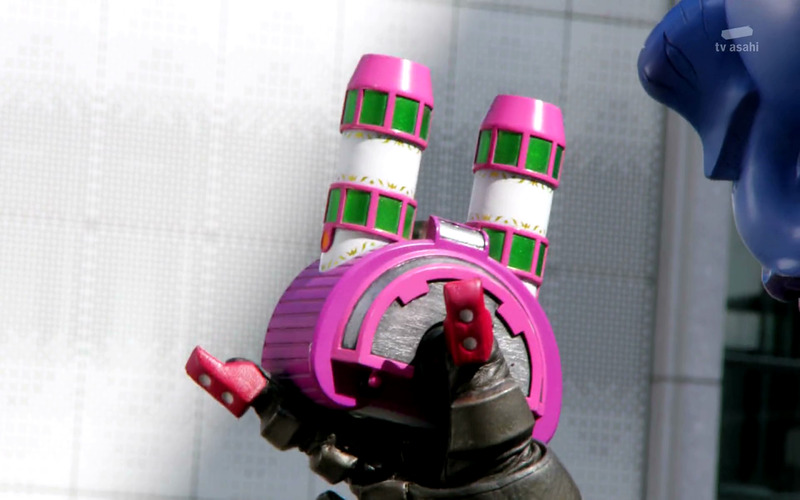 A 5 safe Ganglar has been created Frankenstein style by Gauche and this new monster instantly overpowered the Patrangers. What will become of this new threat? Click "read more" and we shall find out. This episode begins right were the last one left off. Patkaiser (the megazord for the Patrangers) is defeated by the new 5 safe Ganglar, but the Ganglar breaks down because this overpowered form is unstable. 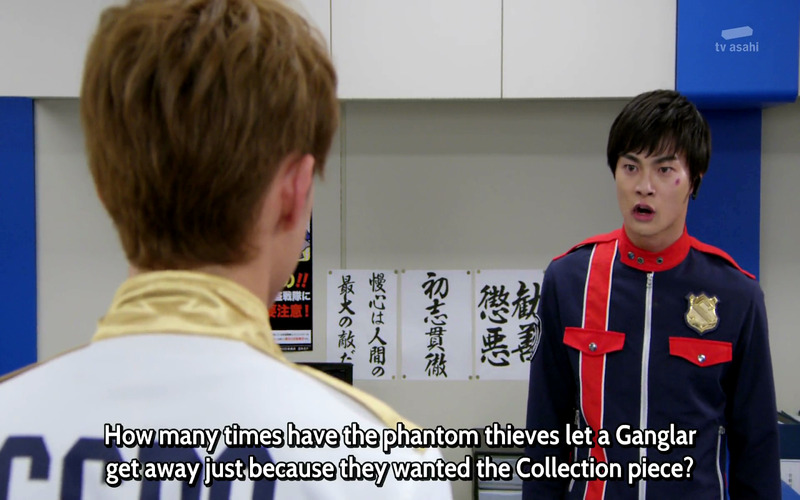 The Lupinrangers happen to be on the same building that this Ganglar shrank down onto and proceed to try and steal the 5 Collection Pieces. 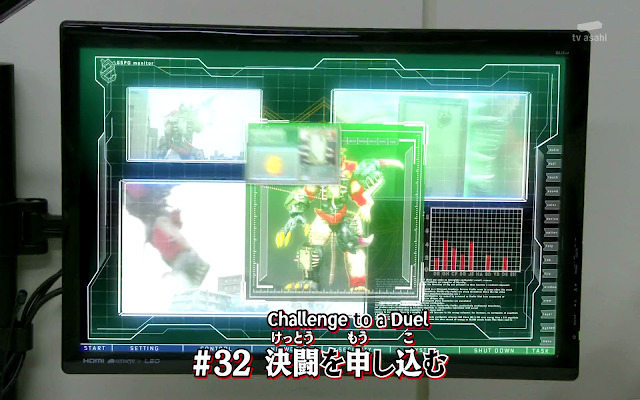 Unfortunately, this proves difficult since the 5 safes are linked together making the Lupinrangers unable to unlock them. If they need to hit all 5 at once, they will be short one even with Silvers help. The fight is cut short when Noël Takao notices a specific collection piece that Gauche has that scares him. Noël Takao has been watching both fights on the sideline and offered no help. Probably because he was the only one smart enough to think a 5 safe jacked Ganglar isn't a fight to rush into. One theme song later, both teams are back at their bases trying to figure out what to do. Jim Carter informs the Patrangers about how this new Ganglar is made of multiple Ganglars and they worry about how to overcome its overwhelming power. Meanwhile, the Lupinrangers are more concerned about the 5 Collection Pieces because they will need to hit all 5 safes at once to get them. Called it! 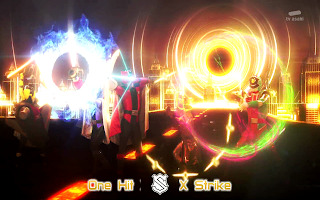 Making the situation worse, there are only 4 Lupinrangers and the triple Red multiply trick isn't going to work because one of the 5 collection pieces cancels Goodstrikers powers. That was actually established in the previous episode. Props for thinking ahead. 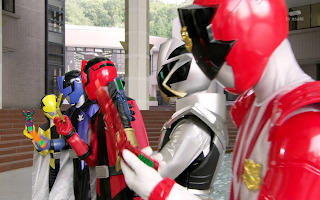 With only one option left, Noël Takao goes to ask for the Patrangers to cooperate with them. They haven't done the 7 mech combination since the Raimon fight so it is natural that the writers would want to create a scenario where they have to use it again. This particular scenario, I am actually impressed by. 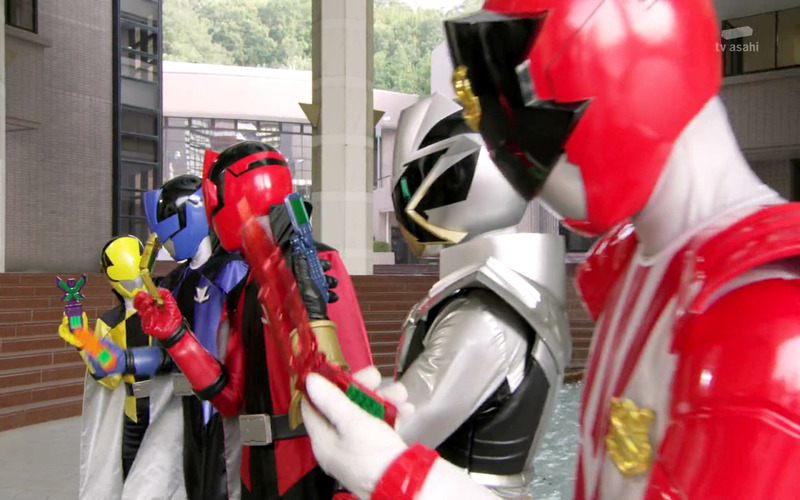 As anyone could predict, the Patrangers, still bound by their call of duty as police, refuse Noël Takao proposal. 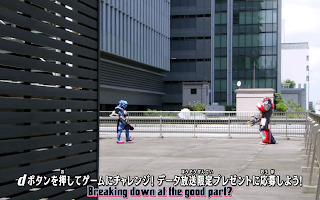 Sakuya and Tsukasa have mixed feelings about the situation but Keiichiro is especially against it not just because the Lupinrangers are wanted criminals, but for their record of ignoring any danger the city or people are in. This is actually a really fair argument. 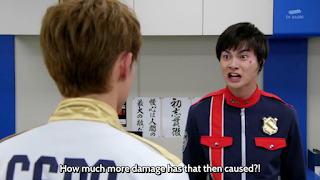 Throughout the series it has been well established that the Lupinrangers don't care about protecting anyone or anything other than their mission. With talking out of the question, Noël Takao challenges Keiichiro to a duel with the wager that if he wins the Patrangers cooperate, but if he looses than the Phantom Thieves and himself will turn themselves in. Keiichiro accepts and ominous music plays over the next few scenes in order to build up suspense. Obviously, Keiichiro can't win or else the series is over, but the drama in this moment is very real. Bonus clip, I just have show this one. It is when Gauche is working on her Ganglar. The stage is finally set, the duel can begin. The two morph into Lupin X and PatRan Ichigo and charge at each other. Everyone loves the extra ranger vs red ranger cliche. 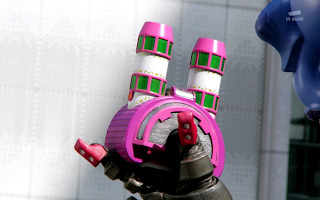 Canonically speaking, Lupin/Pat X has been shown to be the more power ranger, but the two actually have a pretty even back and forth fight while spitting their ideals at each other. In the midst of it, Noël Takao lets it slip that the phantom thieves are fighting to bring back their loved ones which causes Keiichiro to freeze in thought giving Noël Takao the opening to launch a finishing blow. It cuts away before showing if the attack landed. 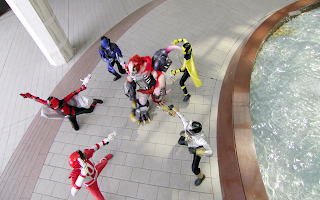 While this is going on, the 5 safe Ganglar has re-appeared and the other 5 rangers all appear to face it trying to by time for the duel to end. They are easily on the loosing end of this battle until Keiichiro and Noël Takao return implying that the latter won the duel. Now, for no reason at all, the rangers are able to fight back and get in position for a 5 safe open strike. I hate it when monster randomly get weaker just because the episode was running out of time. Regardless of continuity, the 5 of them almost effortlessly get to all the safes and claim the Lupin Collection pieces. They're all re-used morpher props! They finish off the Ganglar by using pretty much all their finishers at once in a super CG/over the top scene. I have no idea why they warped to a street. The usual routine plays out from here, Gauche appears and makes the monster grow so we can have our giant battle. As expected, the 7 mech combination with all rangers is used again with some new combinations involving their other VS Vehicles (zords) being swapped in and out. However, the fight itself is terrible. 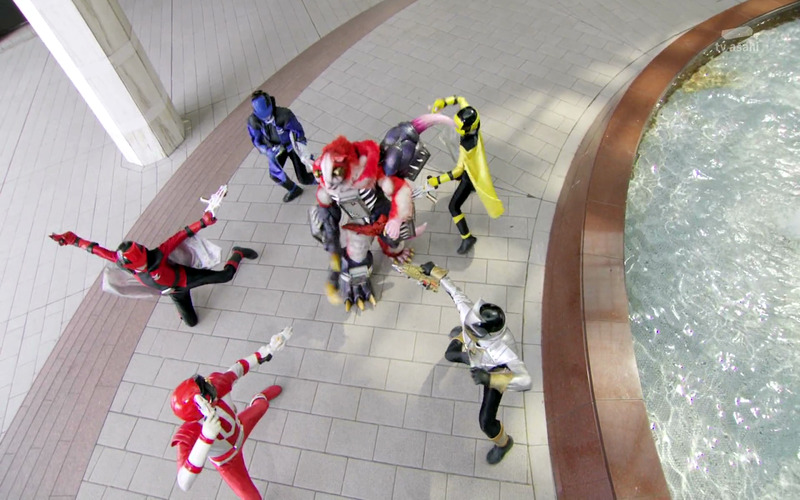 While the rangers cycle through all their fancy attacks, the Ganglar literally just stands there and takes it, never even throwing a punch. Monster goes boom, it is over. 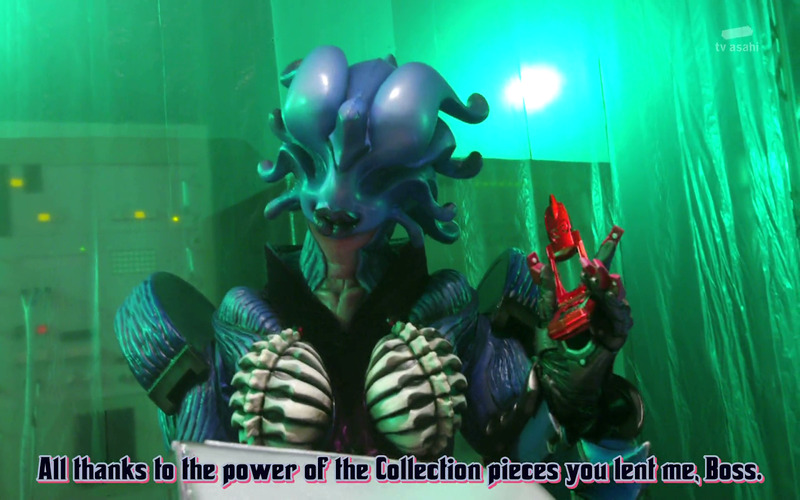 The episode ends with Kogure collecting the 5 Collection Pieces and giving a shocked/concerned expression over Gauche's binocular Collection Piece. In addition, a flashback from Noël Takao reveals that Keiichiro actually had the chance to win the duel but lost on purpose due to hearing about the Phantom Thieves goal. 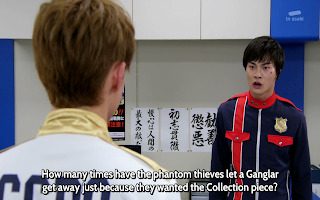 Keiichiro ponders to himself about what exactly will happen when the Lupin Collection is completely gathered. THE END! This episode was so close to being great, but was ruined by a rushed and uneventful final battle with the 5 safe Ganglar. Everything before and after that was very well done. 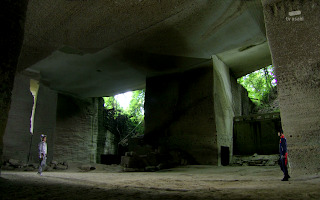 The previous episode ended on a good cliffhanger, the seriousness of the situation was well explained, and the epilogue after the battle was nice and emotional. It really is a shame how it all just fell apart. As soon as Keiichiro agrees to help out, the Ganglar literally stops fighting back and is easily defeated. Overall, I would cal this episode a missed opportunity.